HIS STORY IS now so well known as to be mythologized, his end an emblem of the concussion crisis that the NFL is so close to litigating into history. In the years before his death, Junior Seau suffered from depression, mood swings, forgetfulness and detachment. His behavior became erratic: In 2010, he was arrested for allegedly assaulting his girlfriend. Hours later, he drove his car off a 30-foot bluff. The former star NFL linebacker reportedly told police he’d become sleepy — he also suffered from insomnia. Finally, on May 2, 2012, Seau shot himself — in the chest, presumably so that his brain might be studied — and died. Examination of his brain confirmed that he was afflicted by chronic traumatic encephalopathy, or CTE, the progressive, degenerative brain disease whose only known cause is repeated blows to the head. Seau’s story now has an additional, troubling coda: Were he still alive today, Junior Seau would not be covered by the NFL’s concussion settlement. The landmark deal between the league and its retired players has been sold as essential relief for long-suffering players, resulting in payouts of at least $675 million. But Seau, even with all of his problems, would have received nothing. Any other player now suffering from those same issues would get the same bupkis. For all the headlines blaring about huge awards from the settlement — a maximum of $5 million for ALS and $3.5 million for Parkinson’s disease — most athletes won’t see payouts anything like those. While ALS, Parkinson’s, Alzheimer’s disease, cognitive impairment and certain cases of CTE diagnosed after death are all covered, behavioral issues, like those that plagued Seau — and former Chicago Bear Dave Duerson, who also shot himself in the chest — are not. Former players living with clear symptoms of CTE are simply out of luck. And none of this begins to describe the procedural hoops and rings of fire players must jump through in attempting to claim money from the deal. By October 14, retired NFL players had to decide if they wanted to opt out of the settlement. Only a small fraction chose to forgo the benefits of the deal and preserve their right to sue the NFL in the future. But more than 200 people filed objections to the settlement, from attorneys to injured players. Bob Stern supports the objectors. 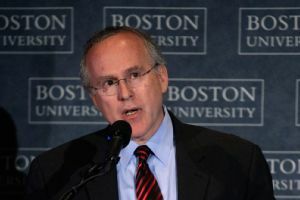 An affable 55-year-old who once dreamed of becoming a Broadway singer, Stern is a professor of neurology, neurosurgery and anatomy and neurobiology at Boston University School of Medicine, where he oversees clinical research at that school’s Alzheimer’s Disease Center. He also treats many former players clinically. Over the course of this year, Stern, a typically private man, felt an increasing need to speak out about the settlement, because the closer he looked at its fine print, the more firmly he concluded it wouldn’t live up to what players were expecting — and that they would be blindsided by it. Chris Seeger, the co-lead counsel for the plaintiffs, has been saying things like, “It turns the page on taking care of the retired players up through the date this case was preliminarily approved, to make sure that if they get sick, there’s money there for them.” But Stern realized those players would have to parse their own lawyers’ words incredibly carefully or they’d be woefully misled. There is one final bar for the settlement to clear before it becomes official: The NFL, the players’ lawyers and the objectors are all gearing up for a fairness hearing on November 19 in Philadelphia, where U.S. District Court Judge Anita Brody will decide whether or not to give final approval to the settlement. The well-being of thousands of former NFL players hangs in the balance. SUPPOSE YOU ARE a former NFL player concerned about your health and you want to receive help from the settlement. Stern calls the algorithm for translating test performance into compensation categories “not supported by any scientific literature” and has concluded that it will block players with serious memory loss, attention deficits and other cognitive problems from getting benefits they deserve. Fewer than 3,600 athletes, or about 17 percent of all retired players, will end up with some kind of illness that the settlement will compensate, according to forecasts by both sides in the case. Even if a player makes it into that group, he will still face hurdles to a significant payout. The deal contains a matrix that determines awards based on age and type of illness. It then reduces the compensation for those who played less than five seasons in the NFL and cuts it drastically if they have ever suffered another traumatic brain injury or a stroke, on the theory that pro football is less likely to be the cause of their current problems. For example, if someone played eight years in the NFL and is now 45 and diagnosed with ALS, he is eligible for $4.5 million. If the retired player is 75, played three seasons, had a stroke and now has Parkinson’s, he stands to get at most $87,000. Stephan Savoia/AP Images Dr. Bob Stern, of the Boston University Center for the Study of Traumatic Encephalopathy, has major concerns about the NFL concussion settlement. On its face, adjusting compensation based on age seems to make sense — the younger you are, the longer you have to live, the more you need money. But because former players must be so impaired to qualify for a payout, many who need help now will have to wait until their brains degenerate further and further to qualify, dramatically reducing their compensation. In fact, players who get qualifying diagnoses will be an average age of 77, according to the plaintiffs’ projections. The average age of NFL retirees is 51. “The cutoffs exist because the settlement was designed to limit the amount of money to be paid out,” says Steven Molo of MoloLamken, a firm representing players who are objecting to the deal. So average awards from the settlement will probably be far lower than you might expect: $190,000 in today’s dollars for victims of Alzheimer’s disease, according to the plaintiffs’ own actuaries, and $140,000 for retirees with severe dementia. Those two groups make up more than 97 percent of the athletes who will get compensation. Support for the deal seems to rest on widespread underappreciation of how hard it will be for former players to actually get money. In January, Brody, the judge, rejected the first version of the settlement because she was concerned the $675 million agreed upon to go to the players was not enough. After further negotiations, the league agreed to wipe out the cap on total awards to players, and in July, Brody granted preliminary approval to the deal. The revision seemed like a huge breakthrough, and reaction was ecstatic. “Whoop, There It Is. Concussion Settlement Fixed!” read a headline on the Pro Football Concussion Report website. But the NFL and the plaintiffs’ attorneys, based on the league’s actuarial estimates, still only expect payouts to total $675 million. Crucially, while the total awards have no ceiling, payouts on individual awards remain capped. The league, which declined to comment for this story, clearly understands how difficult it is to draw money from the settlement, even if all the retired players do not. Moreover, in exchange for agreeing to remove the overall cap, the league won the right to appeal an unlimited number of awards, up from a maximum of 10 per year in the initial settlement. The agreement cuts players off at the other end too: Only the families of those who died with CTE before July 7, 2014, the date of the settlement’s preliminary approval, qualify. The families of any players deceased after July 7 get nothing. Eric Williams, for example, is a former defensive lineman who spent 10 seasons with the Lions and Redskins. Now suffering from several forms of neurological impairment, he wrote to Brody in July to object to the settlement, because, as he put it, “Based upon my knowledge of the agreement, [a] player even with all my documentation and testing won’t qualify for any or much relief if any at all.” About CTE specifically, he wrote: “There is an overwhelming chance my family [will] have a lifetime of medical bills, including long-term care, on its horizon. But the only time the family can get relief is after I’m dead?” But his situation is worse than Williams realized even as he was protesting the settlement. His family will never qualify for the high award level of death with CTE because he didn’t die before July 7. Or as Anderson put it, “It’s been negotiated into extinction.” And for every case of death with CTE that doesn’t have to be compensated, the NFL will save $1.4 million, according to data from the players’ lawyers. 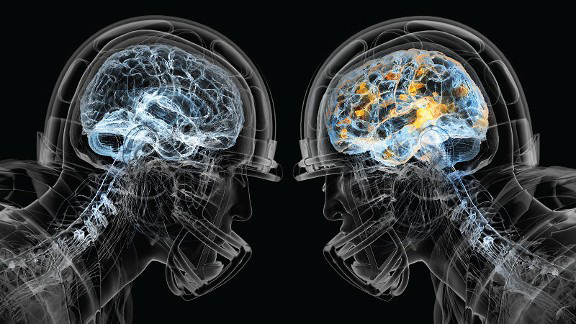 Stern has published research that shows many CTE victims display serious mood or behavior changes at a younger age, before developing cognitive problems when older. A key part of the league’s and plaintiffs lawyers’ defense of the deal is that players with CTE will get help when they are “really” sick. But for many former players, that will mean dealing with emotional problems for years before they become impaired enough to qualify. Over the summer, Stern heard from a group of lawyers from Kansas City, including Anderson, who wanted to see how their clients would fare under the proposed settlement. One by one, 22 athletes traveled to Boston in August and September, made their way to the Robinson Building at the BU medical school and sat in a recently vacated office, empty except for a desk and a computer, so that Stern and his assistants could put them through the settlement’s test battery. The outcome stunned the athletes and their attorneys: All of the players had emotional or behavioral issues. Many had memory or speech or spatial-skill problems and most had cognitive difficulties. But zero would qualify for help according to the settlement’s algorithms. THE ATHLETES WHO are suing the league faced serious legal hurdles from the beginning. For one thing, in August 2012, the NFL moved to dismiss their cases entirely, arguing that the league’s labor deal, not the courts, should resolve injury disputes. (Brody put that argument on hold when she ordered both sides into mediation.) For another, if the lawsuit went to trial, the players would have needed to prove the NFL willfully and intentionally misled its athletes about the risks of brain injury. The case was not a slam dunk, so some kind of compromise was always a strong possibility. The NFL has a recent history of recognizing cognitive problems but not behavioral ones. Under its 88 Plan and Neurocognitive Benefit Plan — which both were introduced under commissioner Roger Goodell and help retired players suffering from issues like dementia — players don’t have to prove that football caused their injuries but do have to waive their right to sue the league. That’s the model the NFL has carried into the concussion settlement. What the NFL hasn’t admitted and won’t admit is that its league might produce an industrial disease, like black lung from coal mining, that can cause radical behavioral changes in younger players. By writing CTE and its possible manifestations out of the settlement, the league has scored a huge legal and political victory that will resonate for decades: The NFL does not have to admit the existence of a football-specific degenerative brain disease. Even if scientists develop a reliable test for CTE in the living — something Bailes, Stern and other researchers say is close at hand — the settlement goes out of its way to thoroughly exclude what such a test might find. “For the avoidance of any doubt,” it says, “the identification of any condition — for example, through a blood test, genetic test, imaging technique or otherwise — that has not yet resulted in actual cognitive and/or actual neuromuscular impairment experienced by the Retired NFL Football Player does not count as a Qualifying Diagnosis.” So even if you find out you have CTE, you won’t be eligible for help. So how, if this deal is so bad for former players, did their lawyers agree to it? The settlement included another extraordinary provision: The NFL agreed to pay the plaintiffs’ attorneys $112.5 million, without objection, within 60 days of the final settlement. This “clear sailing” provision left many players and advocates howling. The NFL and the plaintiffs’ attorneys both now want approval for the settlement and are making similar arguments to support it — for example, that it will provide immediate help for former players like Kevin Turner, a lead plaintiff who is suffering from ALS. For years, players were misled by the NFL about the dangers of concussions. Now those players deserve a full measure of help, not further deception.